Do you know that you can translate scanned copy of document to editable one? 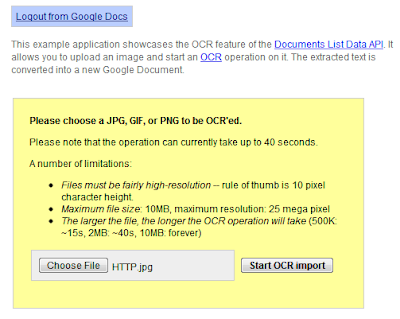 This technology is called Optical character recognition (OCR) and it is now available online through Google Docs. You can upload an image containing typewritten or printed text (like a fax or scanned document) to your Google Docs account and it will turn that image into editable text. Here is step-by-step procedure to do it. 1. Go to DocList API OCR Demo. 2. Click the "Choose file" button to locate the image you want to translate. 3. Finally, Click the "Start OCR Import" to begin the OCR conversion. This OCR feature is not officially part of Google Docs UI but you can access it through Google Code. You must have a Google Account to use this online service. OCR conversion supports JPG, GIF, or PNG.